PLEASANT HILL, Ore. – When the late author Ken Kesey and his pals, the Merry Pranksters, took their psychedelic bus ride across America to visit the New York World’s Fair, the nation was mourning President John F. Kennedy’s assassination and the Grateful Dead was not yet a band. For their trip, they rode in a bus painted with brightly colored swirls, outfitted with a sound system and emblazoned with the word “Further” as the destination. Sporting short haircuts and red-white-and-blue sport shirts, they had plenty of marijuana and LSD. 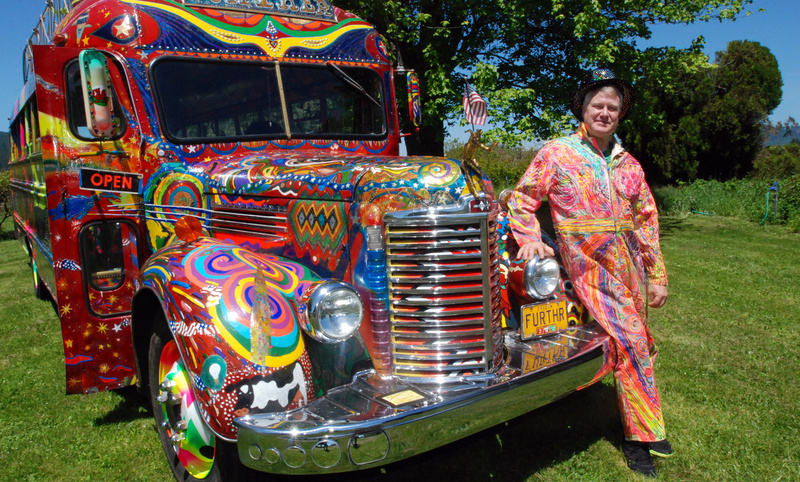 “The whole psychedelic scene came from that bus trip,” said Kesey’s son, Zane, who as a 3-year-old helped paint the bus and waved a tearful goodbye as it drove away. His father, who wrote “One Flew Over the Cuckoo’s Nest,” had been a guinea pig for government tests of the mind-altering drug and shared the experience at a series of parties at his home in the hills above Stanford University that became known as the Acid Tests. They featured a local bar band called The Warlocks, which turned into the Grateful Dead. After the trip, the bus became the centerpiece as the Acid Tests went on the road. After a road trip to New York with his parents and wife, Faye, to see the stage production of “Cuckoo’s Nest,” Kesey thought it would be fun to get his friends to do another cross-country ride that would serve as the basis for a movie, with LSD at the center, friend Ken Babbs said. It soon became clear that the family station wagon would not be big enough, so Kesey sent a friend up to San Francisco to check out an ad for an old school bus converted into a camper, with bunks and a kitchen, Babbs said. “I think it was $1,500,” he said. The movie never materialized as the new art form Kesey had envisioned, a victim of the film and audio tapes reproducing at different speeds that couldn’t be synchronized until 30 years later with the help of digital technology. Kesey died in 2001. Texas A&M historian Terry Anderson, author of the book, “The Sixties,” said the bus trip was too early to kick off the counterculture, adding that it was overshadowed by the Beatles and the signing of the Civil Rights Act the same year. But the tapes and film gave author Tom Wolfe the material he needed for his 1968 book, “The Electric Kool-Aid Acid Test,” which made the trip a touchstone of the psychedelic era. People who want a chance to get on the bus must invest $200, and pass a series of tests. The chosen will get a token to board the bus for a leg, and join in making a new movie.